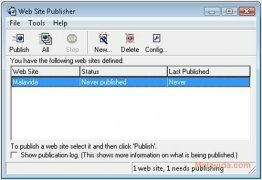 Web Site Publisher, as its own name indicates, is an FTP client that has been specially designed to upload the contents of a website, without any need to know computer knowledge. You will only have to select the appropriate button of the program and the process will be completed automatically. The first time that the application is launched, an assistant will appear, that will ask you to input all the information regarding the website: it's name, where all the files are stored, the user name and password, the FTP server, etc. 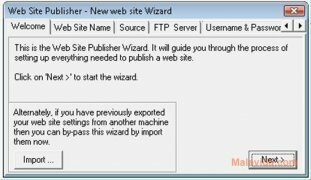 Once this simple FTP client has all the data, the rest of the process will almost be automatic. The program has intelligent recognition, thus, it will only upload the new files or those that have been modified, as well as eliminating all the files that are no longer in the selected folder of the computer. The program's interface maybe somewhat outdated if you compare it with the latest designs, but the program really does its job. 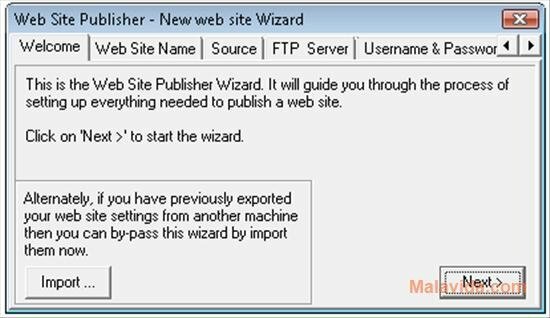 Therefore, if you need an FTP client that will allow you to upload your files to a server in the easiest fashion, download and install Web Site Publisher, it is free.